A Lovely Angus Top - Crow Craigies. Glen Doll is an amazing place. It's where I started walking and I try not to forget about it as I start to venture West to hillbash. Sometimes a completely unplanned ramble is just as pleasing as any walk. 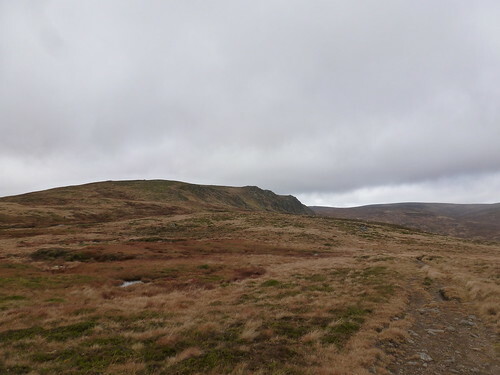 I swithered about posting this report because it didn't link to any WH routes but it's a walk I thoroughly enjoyed and would recommend to anyone. When I did Tolmount I did it from Glen Shee. 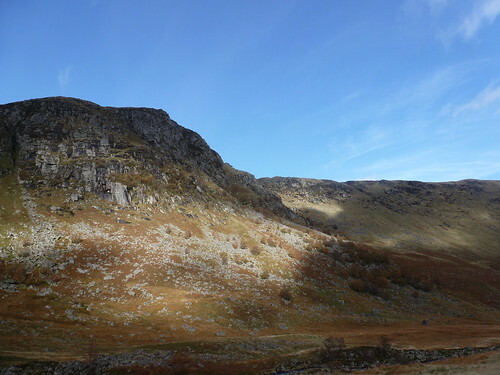 The Glen Doll approach is much nicer and would hardly add an hour onto the walk I did yesterday. I set off from the carpark at 10am having forgotten to bring change for the parking. 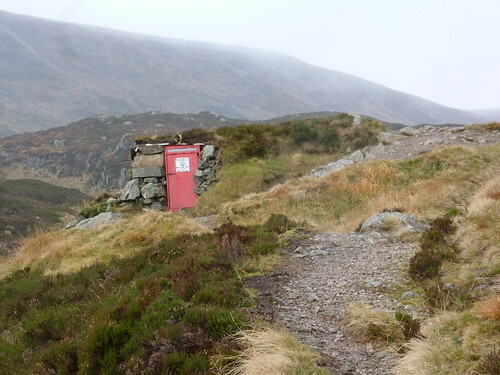 The ranger advised me when I returned that the metres were broken but in March a barrier is being installed so remember your change when you go to Glen Doll folks! Conscious of the days being shorter I had a few plans for the day and only really decided which to pursue when I got to the start of Jock's Road. 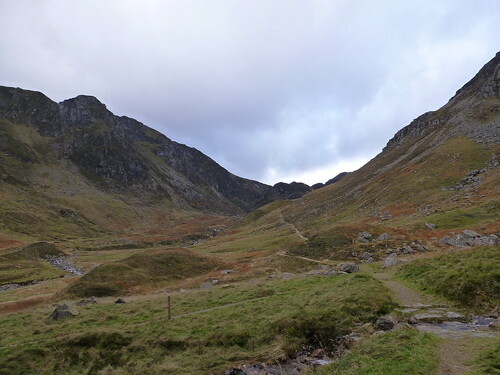 Corrie Fee and the Munros are usually the winning route but today the less popular Jock's Road was the winner. I set off through the forest which was painted in beautiful autumnal colours. The only sounds I could hear were the rutting stags and the rustling trees. The stags roaring were coming from all direction and it sounded quite intimidating. 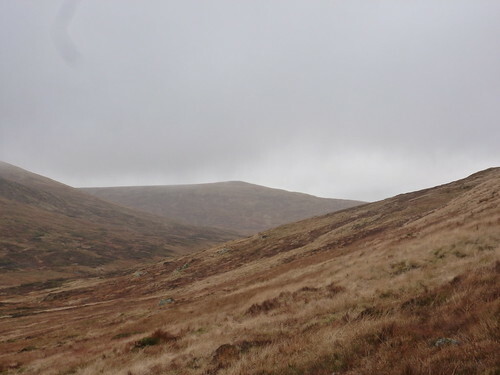 Once I emerged into the open Glen Doll I could hear the stags were on the hills to the west. Their silhouettes appeared every so often. 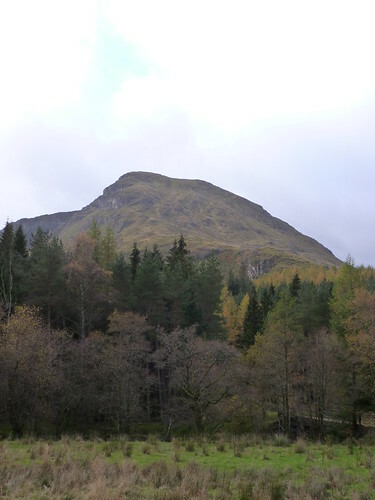 As I climbed up the head of Glen Doll I decided I was going to go up to Crow Craigies which is a top belonging to Tolmount (I think). The weather was a bit rubbish and the drizzly rain which laughs at goretex was constant. Passing Davie's Bourach I always have a peek. Not sure exactly what I expect to be different but I look anyway. I always hope I never have to spend the night in it. Definitely not the type of place you'd choose to stay in. Once I was up past Davie's Bourach on the plateau the wind picked up. I was conscious that we were due a hurricane next day. The last time I went into the hills with a similar forecast for the tail end of a hurricane I was stranded in a bothy in the Cairngorms! With that in mind and the chance that it could arrive earlier than forecast I picked up my pace. In my rush to get to my destination I managed to lose Jock's Road. It was an unpleasant boggy mess but I quickly found the path again by looking at my map. I could see two people about 10-15mins ahead of me persevering with the mudfest. 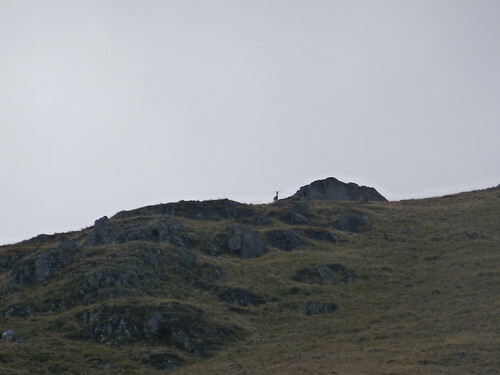 They must have seen me striding along what the path and met me before the final short climb to Crow Craigies. They were heading for Loch Esk and had completely missed the path. 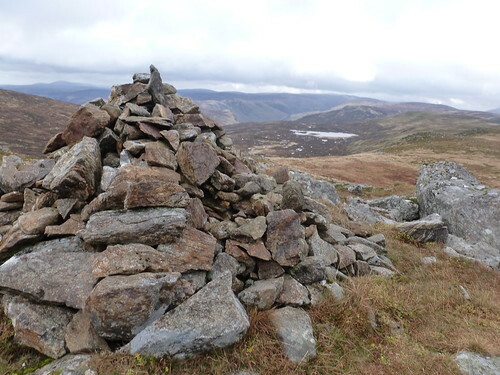 I advised them that there was a fence post and cairn back along the path and set off to Crow Craigies. The path once I had rejoined it. Much nicer walking! I had been up Crow Craigies a year previously I thought. The visibility was much better this time around. I don't remember the cairn being so big and I did pass a smaller one this time which makes me think last time I didn't quite make it! The real Crow Craigies summit. GPS confirmed! Loch Esk in the background. From here it's only a short hop to Tolmount. I would definitely advise anyone trying to do Tolmount from Glen Doll to follow the path to Crow Criagies then branch off. The bog is pretty unpleasant. I didn't hang about for long as the wind was really starting to howl. I thought about going across to Tolmount just because but I was almost blown on my face and as much as I was enjoying the rugged beuaty of the Mounth I decided it was time to get off the high ground. 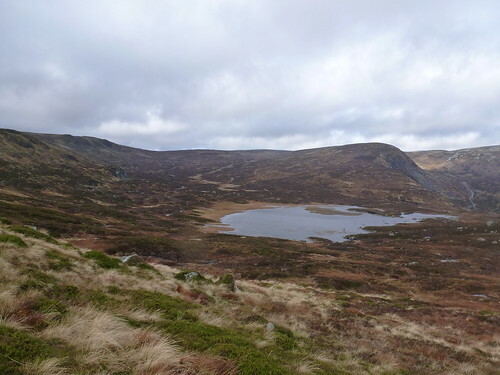 I decided to head towards Loch Esk before the cairn I had informed the other walkers about earlier. I was met by another bog before meeting the path - I should definitely have taken my own advice! Loch Esk was completely free of birds. The last time I was there a couple of hooper swans were residing there. I did see a few hares in this area and their bellies are starting to turn white! 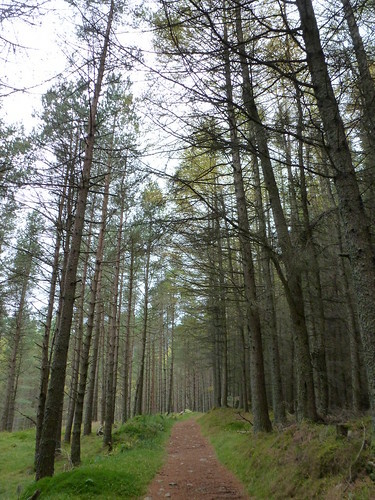 It was a lot more sheltered here so I stopped for a quick bite to eat before heading down through the Bachnagairn woods. 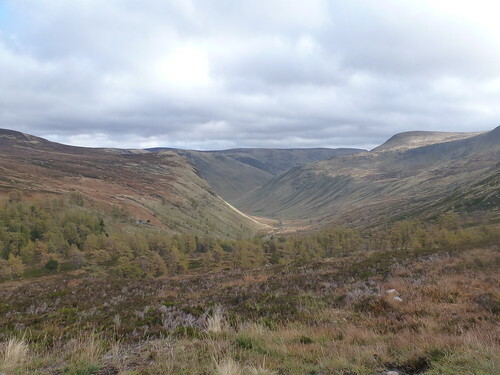 The view along Glen Clova here is lovely. The little river was quite angry and made for a good view from Roy Tate's bridge. 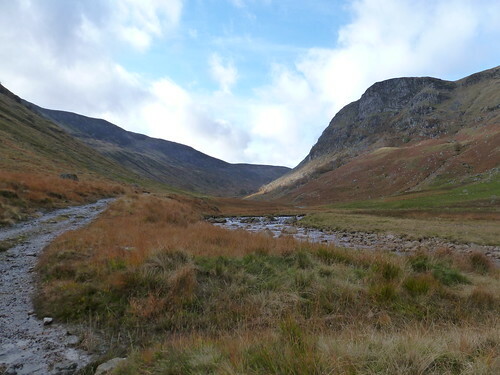 In no time I was down on the flat road along Glen Clova. The weather had improved massively and I was a little bit gutted I hadn't gone on and done a little more but the views in the glen were equally pleasing. The sky had completely cleared. It was a different day altogether. Where is this hurricane we were meant to be feeling??? At this point I'm pretty sure I saw a Merlin fly overhead. My bird of prey from beneath IDing isn't all that great though. It was definitely the right size and shape. There were certainly plenty of deer in Glen Clova and on reaching the bridge close to the Strone I met the ponies. Soon after I heard a shot. If the guys with the ponies were the ones with the guns then they shot from a pretty fair distance. Assume there were probably others up on the hill somewhere. Don't really know how the stalking works. Deer on the top of the Strone. All in all I was a little bit disappointed not to have ventured further with the improved weather but it was nice to get home at a reasonable time. It might not be a walk with gets any blue balloons but it quite easily could be. Re: A Lovely Angus Top - Crow Craigies. Nice one cmarcol, that looks like an excellent walk! 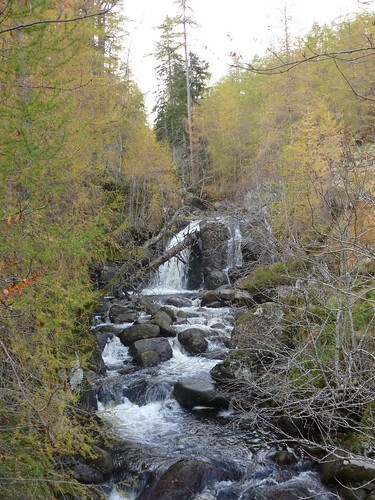 I have only been to Glen Doll for Mayar and Driesh, and already decided I will return to do it a bit more justice. I agree, it is an amazing place, your pictures capture it very well. Oh definitely do that! It's one of my favourite places. I used to live in Dundee so was up there any free afternoon I had. It was less than an hour away in the car. I noticed a Cicerone guide to Angus in Waterstones last week and it had some really good route suggestions in it. I'd really like to go the whole way along Jock's Road and link it up with the Larig next year such a brilliant place! It looks like there's some really nice scenery on that walk, Cat. Like Silverhill, I really enjoyed this area when I visited it to do Mayar and Driesh. Was that the last walk in the old jacket?